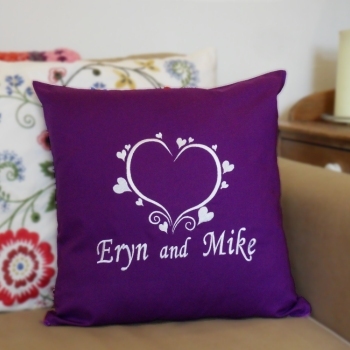 Bespoke embroidered purple cushion beautifully embroidered with a name or little message your choice and art deco style love hearts motif. Approx 41cm or 16 inch square 100% cotton cushion cover in Cadburys purple colour. Beautifully sewn in a thread colour of your choice to make a fantastic Personalised cushion. If you want to add a motif please select from the options.